It is the timer application which can terminate the specified application. QuitApp++ is the application which can terminate or launch the specified application at the specified time. Launch and the terminate can choose a setup, whether it usually ends, or it ends compulsorily by configuration. During timer operation, it remains by Drawer or a floating window, and time can be checked. Support for OS X 10.8. Support for Mac OS X 10.5. Others, the correction of the cord. Fixed a display issue preferences. I signed with the developer ID. Even if Gatekeeper of 10.8 is effective, the QuitApp++ is usable without a problem. Changed support OS, 10.6 or later. A problem that prevented starting under Mac OS X 10.3.x corrected. Full support for Mac OS X Leopard. A potential bug was corrected. -This bug prevented the second item in the list from functioning correctly in certain cases. QuitApp now has automatic updates. QuitApp properly recognises 256x256 icons. Support for 64-bit architecture under Leopard was added. Two modes are now available, Normal and Compulsive. -Normal Mode is the standard mode; it works just like previous versions. (protecting any work that was open at the time). -Compulsion Mode is special, in that applications will be made to quit immediately, causing anything that is open to be lost. It will not hesitate to quit applications with unsaved data, as Normal Mode does. A bug that prevented timers from being started in certain cases was fixed. Drawer will automatically close when timers are not running. An issue that caused the time to display as 24 o'clock when switching days was fixed. There is now an option which allows you to have a floating window if you desire. -QuitApp will remember times when you check the box for each item. When QuitApp has remembered times, it can automatically start timers if you wish. You must have time values memorised by QuitApp for this to work. You can now cancel certain timers and modify them whilst they are running. Problems with closing windows have been fixed. Fixed a problem involving items being changed via the menu. 1 : Item names are now displayed in the sub-window. 2 : The sub-window can now be made transparent. 3 : The font colour and window colour can now be changed. 4 : Less CPU is used for displaying information in the sub-window. 1 : aqua tab is stopped, and it changes to the switch by the toolbar. 2 : When the button of the end start is switched to no set of the item, the problem of canceling is corrected. 3 : QuitApp now checks to see whether or not a timer is running, so the cancel button is not always lit. All of the code has been optimised, and memory consumption has been reduced. Fixed a problem that occurred when many items were in application lists. Fixed a problem that caused timers not to update correctly if values were changed while a timer was running. Added the ability to select applications and other settings quickly using a menu. You can set items by clicking them. Set a second item by command-clicking. -You can register an item in the preferences. The main window automatically receives focus when the sub-window is closed. Added an effect to the sub-window. Improved support for applications with foreign characters in names. The code for processing starting and ending has been optimised. A problem that kept QuitApp from quitting two applications simultaneously has been fixed. An update menu item was added to the menu. A problem that caused timers to stop if the menu was opened was fixed. A problem with the sub-window was fixed. A problem that caused QuitApp to misinterpret the on/off status of timers incorrectly has been fixed. A problem involving timers turning on and off incorrectly has been fixed. There is now a sub-window for timer status. The buttons are now smaller, and their look has been improved. Instead of a checkbox, the timer can be turned on and off with a button. The logic of the timer is changed. 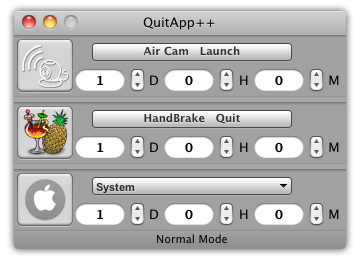 A problem that caused QuitApp to unexpectedly quit when run for the first time under Mac OS X 10.3.x was fixed. A dialog box for notification of quitting/shutting down has been added. It is now possible to start applications in addition to quitting them. Whether or not each button starts or ends an item should be set using the preferences. The problem of the timer not being able to be correctly set and operated on certain days has been fixed. A mistake that caused 0 to display in timers where it did not make sense has now been fixed. QuitApp is now called QuitApp++. Apps now quit based on a set time. Two applications can now be quit instead of just one. The shutdown, restart, logout, and the sleep operations were added as choices for timers' actions. The time remaining can be viewed in a drawer now. The drawer can open automatically. Reduction of CPU usage rate, etc. QuitApp now quits after the timer has finished, too. Changes were made to the way timers are coded.